Basecamp vs Highrise. 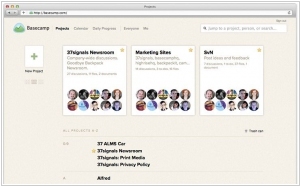 What is the best of Project Management tools? Highrise CRM allows to save and organize notes and email conversations for up to 30,000 customers and contacts, keep track of proposals and deals, share status with your company, department, or team. One of the biggest dings against Highrise has been our lack of reporting. Sometimes you don’t need content out of Highrise, you need to know numeric activity. So the developers decided to implement this feature. Now you can just click the new activity filter Statistics from Latest Activity, and you’ll find reports like, notes created, emails received and sent, tasks assigned and completed, deals won... Besides, Highrise added the ability to filter Activity Feeds by Email, Notes, Comments, or Files and by User. You can still filter by Latest Activity and see everything at once, or you can pick Notes to limit the view to only Notes or go even further and limit to Notes created by you or another User. These filters are also on any of your contact, deal, or case activity feeds. Mobile applications have won over HTML5. At least at the current stage. Jason Fried, the head of the super popular project management service Basecamp, never intended to follow fashion trends or making something just for PR. He always did what he considered necessary for the effectiveness of his product. For a long time his position on mobile access to Basecamp was following: "We won't chase the variety of mobile platforms, but will do what we can do best - create and develop the Web-interface." Therefore, so far Basecamp for mobile devices was available only as a web app. But at last Jason has come to the conclusion that the native client would be more convenient, and from now Basecamp is available as a native app for iPhone / iPad. The app is free and features the new beautiful style of the web version.